Happy 2018 New Year! The time is now for any new resolutions or healthy additions to lifestyles that may benefit...or alternatively harm us! One thing that I have noticed in our practice is tooth wear, which can be from a variety of factors: brushing, diet, 'grinding', or even from bulimia. All of these factors can be differentiated into 3 main types of tooth wear causes: Abrasion, attrition, or erosion. Let's talk about abrasions! Abrasions are defined as progressive loss of tooth structure caused by mechanical actions other than mastication or tooth-to-tooth contacts. What does this mean? It means that if you have any physical contact with another object that is not from another tooth causing tooth wear/loss, it is an abrasion! What is touching our teeth most of the time? Toothbrushes! Toothbrushes, or rather, incorrect toothbrushes and techniques can not only cause tooth wear, but also gum recession. Other things like biting nails or opening bottle caps also count, but the result is the same: typically some notching and root exposure at the junction of the tooth crown and root. The American Dental Association (ADA) recommends using only soft or extra-soft bristle toothbrushes. Hard or medium bristle toothbrushes have been shown to cause severe abrasion and tooth wear as well as gum recession. Attrition is the progressive loss of hard tooth substances caused by mastication or grinding between opposing teeth. This means that tooth wear can be caused by other teeth and/or what we are eating! The extent of attrition and wear will depend upon the use to which an individual puts their teeth. For example, people who typically clench or grind their teeth (a condition known as bruxism), e.g., during sleep, are more likely to have severe tooth wear. It will also tend to be more pronounced in people who eat a particularly fibrous diet. People who chew ice also show severe signs of attrition! Attrition typically presents itself as a shortening of the teeth over time as the enamel and softer dentin parts of the tooth start to wear away from what they are hitting against. Erosion is the progressive loss of tooth substance by chemical or acid dissolution, and no bacteria are involved. Erosion of tooth surfaces is mostly the results of too frequent or inappropriate use of carbonated drinks (including sparkling water) and fruit juices with high levels of acidity. This habit would appear to be particularly common amongst teenagers and young adults. Erosion is also a problem in individuals who suffer from gastro-esophageal reflux disease (GERD) or from certain eating disorders (e.g., anorexia, bulimia). In addition, risk of erosion is high in individuals with a low “unstimulated” salivary flow rate. Crowns and fillings can be used to repair/replace lost tooth structure from tooth wear, however, they do not fix the cause of the problems. Learning to recognize the cause of the problems is the way to address and prevent it from happening in the future. Talk to your dentist if you have any questions regarding tooth wear, as all dentists are trained to look for and spot for signs and etiology of tooth wear! What are options for replacement of missing teeth? Teeth are the workhorse of our masticatory system and provide us with the ability to break down our food into digestible parts that help to provide us with proper nutrients and fuel for our bodies to keep going in life. However, through neglect, trauma, oral disease, or development, there may or may not come a time where we may need teeth removed and then we are left in a dilemma. What do we do with an area missing a tooth? There are several options that we typically go through with patients as far as replacement of missing teeth, including dental implants, bridges, or removable partials. Dental implants are the best replacement for missing teeth currently available to patients. Essentially, a dental implant is a screw that is surgically implanted into the jawbone that mimics a tooth root. 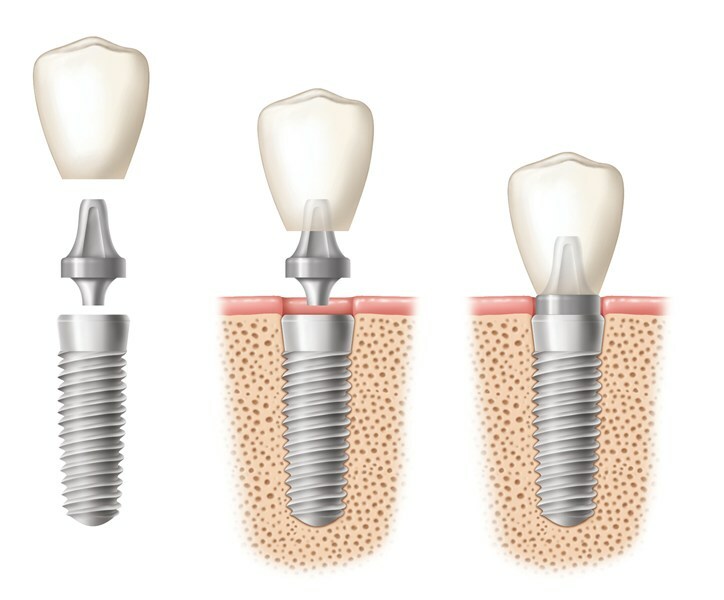 After bone heals around an implant and into the threads of the implant (a term called osseointegration), then a crown can be fitted onto the implant using an implant abutment which connects to the implant and provides the stability needed for a crown. Without going into details, a dental implant can only be placed where there is adequate bone (width & height!) in the area. I typically tell my patients that it's like mounting a TV on a wall, we are looking to put these things into a stud rather than a drywall! 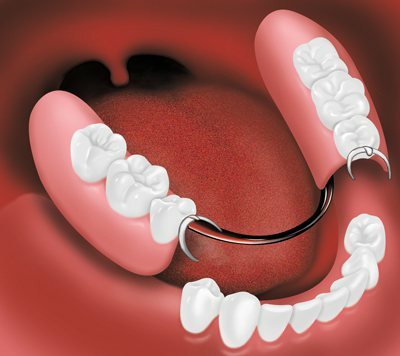 Bridges are the next best option for replacement of missing teeth! After a tooth is removed and the gums have healed sufficiently, the two teeth in front and behind the teeth can be prepared to receive a bridge that can help replace the missing tooth area. Most commonly, bridges are recommended to patients who are not interested in performing any surgery and would like a fixed restoration that they don't need to take in and out. Partials are the last treatment option, and is essentially a prosthesis which can go in and out of the mouth. The downside is that they are not as strong as a bridge or implant, and tend to accumulate plaque on the prosthesis themselves. Every situation is different with regards to the best restoration for each area. Despite painting a rather black and white explanation, there are nuances to each option and the best one for you may be dependent on a number of factors. Please talk with your dentists if you have any missing teeth and discuss your options! Cracked Tooth? What Do I Do? Happy mid-September!! By now, most kids have, for the most part, geared up and are already back at school exercising their minds. With that in mind, many people experience anxiety and sometimes stress as the preparations for the return to school and/or work tends to do. Around this time of year, I also tend to see patients in our practice complaining of "pain whenever I bite down" or "sensitivity to hot and cold". The pain or sensitivity doesn't last very long, and it doesn't happen all the time, so what's going on? Teeth are like windshields in a car, pretty durable to everyday use, however, with wear and tear, there's always the possibility of developing a crack in a tooth. When there's a crack in a tooth, it usually starts small, but over time, it can progress to larger problems. Like anything, catching the problem early enough will prevent further problems down the line. If you think you have a cracked tooth, make an appointment with your dentist to have a look. Early detection can prevent the teeth from needing root canals or extractions, saving lots of hassle and toothache from happening! Check out the video below to see exactly what I'm talking about! Hi, I'm Peter, your new dentist. My parents have run this business for over 25 years, so I've been involved in all things teeth since I was born. I'll officially be taking over the family business later this year, and I'm excited to be back home and continue serving the Yorba Linda community. I went to college at UC Irvine, graduated from USC School of Dentistry, and worked at LAC-USC Medical Center doing oral and maxillofacial surgery prior to taking over the family business. I've had the great fortune of learning from and working with many talented dentists in California and can't wait to share all that I've mastered. This year will be exciting and full of positive changes for the Yorba Linda Dental Office. Make an appointment and come say hi!